Ants can infest your home quickly and get in each of your rooms. 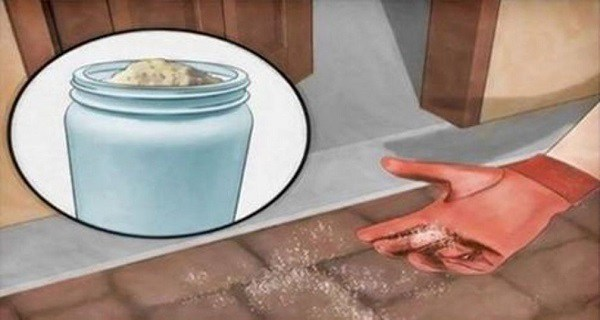 However, there is a simple solution against them – spread some salt around your house and you will thin out their numbers soon. The salt will reduce the moisture and humidity in your house as well. Every household item needs cleaning once in a while. If your brass, copper or silver decorations are left untreated they will lose their shine and appeal, which is why you need to clean them with a mixture of salt and ACV every once in a while. Mix 2 tablespoons of salt with a gallon of lukewarm water, then clean your windows with the mixture to remove any stains. This will restore the natural appearance of your house and car windows and the effects will last for longer. A mixture of salt and hot water can be used to clean the sink and remove odors. In order to rejuvenate your skin, make a bath scrub with some salt and your favorite essential oil. Rub your body with it then rinse with lukewarm water after a couple of minutes, and your skin will look younger than ever. If you want to make your curtains and rugs look like new, a salt-based mixture can do it after just one wash. Soak a cloth in a salt-water mixture and rub the stains on your rug to remove them with ease. Mix some salt in a glass of warm water then rinse your mouth with the solution to reduce toothache and relieve mouth sores. In order to make your teeth white, mix equal parts baking soda and salt and use it on your teeth. This will restore their natural shine. To protect your clothes from shrinking, put some salt in your washing machine and run it.